O-H-I-O. John Boehner? Oh Hell No! 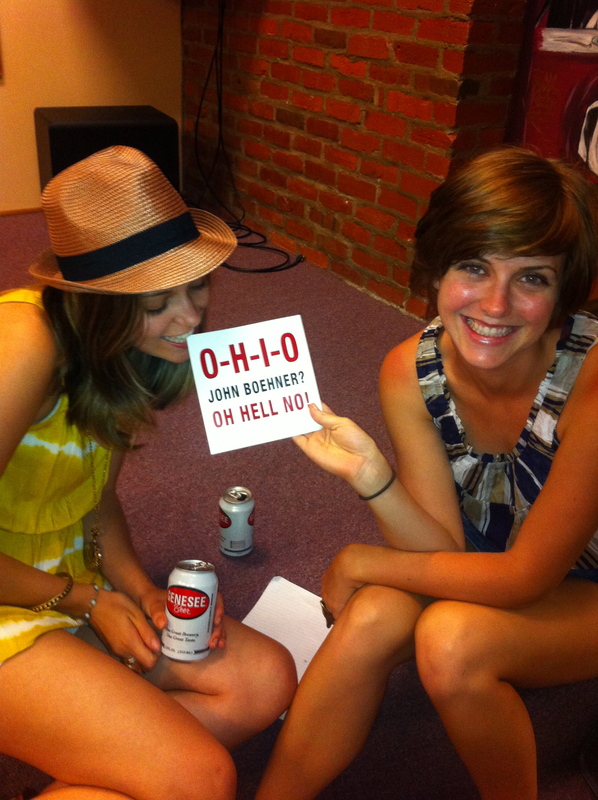 Memo to Boehner: Have fun speaking at OSU Graduation tomorrow! Boehner’s Budget eliminates good jobs and green jobs for grads at a time when youth unemployment is twice the national average. • Boehner’s Budget would eliminate or drastically cut Americorps, destroying more than 75,000 jobs for young people who want to serve their fellow citizens. • Clean energy research and development and loans would disappear or downsize significantly, along with the new jobs they create in areas like wind and solar energy and battery-powered car development. Slashes job training at a time when young workers need it most. • By rolling back funding for education and job training to 2008 levels, Boehner will keep students from learning the skills they need to find a job. • This makes no sense at a time when more than 80% of jobs now require some kind of post-high school training. This generation needs more training, not less to thrive in the 21st century economy. 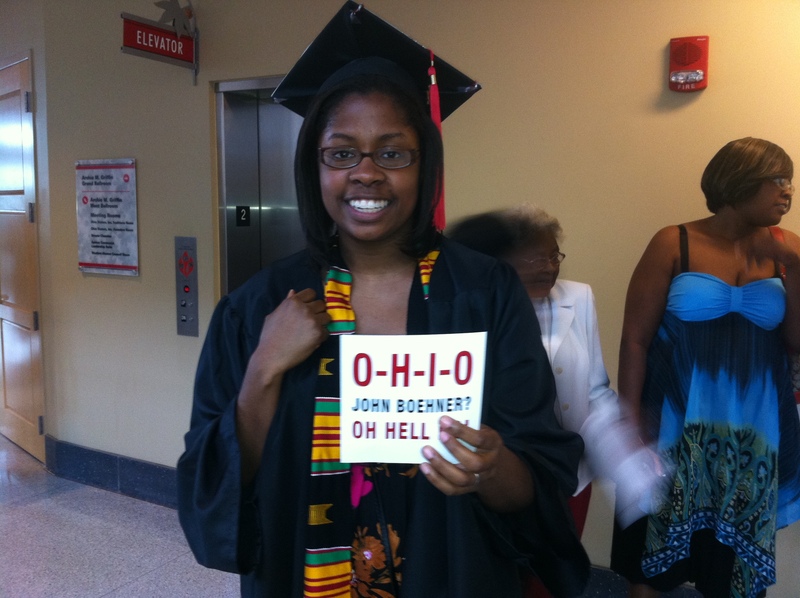 Boehner’s Budget cuts funding that helps the lowest income students go to college. Boehner’s Budget takes away health insurance for young people and increases our costs of care. • You can’t stay on your parent’s insurance until age 26. • Low-income adults won’t get help paying for high-cost individual insurance. • People with asthma, diabetes, or other pre-existing conditions could be unable to get insurance. The most surprising one was this blown-up photo of Jasiri X, standing in Madison, WI holding his own sign: Fox News will lie about this. Other pics: My homegirl (and MoveOn organizer) Mariana Ruiz with Austin King, former Madison City Council President. HOW COULD ANYONE HAVE GOTTEN ALL OF THESE SPONSORS IN JUST TWO DAYS? I am so proud of Lenore and the thousands of other people, but mostly Lenore, for organizing pro-Wisconson rallies in all 50 state capitals in like three days. I’m at the NY rally right now, loving every moment. Progressive Alliance PAC Launch from 6-9 p.m. at Rock Bottom Restaurant & Brewery, 1 W Grand. Suddenly, I am an expert on suburbs. The scariest thing about this piece was my interview with Arthur C. Nelson, who is actually an expert on the cost of suburban sprawl at the University of Utah. He described to me the cost of maintenance on suburban infrastructure as a “2 TRILLION dollar infrastructure time bomb” that will haunt taxpayers for generations to come, and is likely to bankrupt many suburban towns. Enter your email address to subscribe to Billy's blog and receive notifications of new posts by email.